Ready for a midweek escape? Look no farther than Leavenworth, Washington, nestled on the east slope of the central Cascade Range. Fall’s cooler nights and shorter days mean the mountainous region comes alive with vibrant colors of orange, yellow and red, providing breathtaking views as you drive along the Cascade Loop Highway. 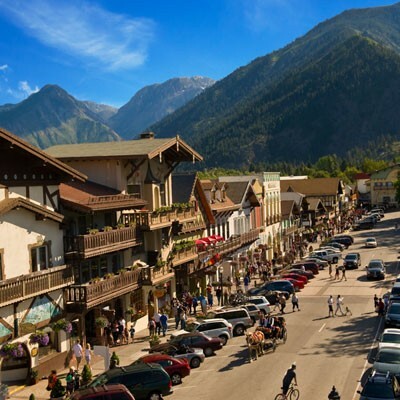 At an elevation of 1,200 feet, the Bavarian-themed village of Leavenworth provides an excellent base for enjoying outdoor activities your family will love. There are over 800 miles of accessible trails for hiking and biking. You can play a round of lateseason golf or miniature golf. Take a walk along the Wenatchee River at Waterfront Park. Visit an orchard to pick apples or pears. Pack a picnic at the Cheesemonger’s on Front Street and enjoy all the sights and sounds of Leavenworth in autumn. If you enjoy the arts, check out the events lineup of music, opera, theater, dance, films and more at Icicle Creek Center for the Arts. While exploring the streets of downtown Leavenworth, you can imbibe in a little wine-tasting in any of 20 tasting rooms. Indulge in an afternoon of “retail therapy” in the shops, followed by some quiet time in Front Street Park. This beautifully landscaped park in the heart of downtown provides a welcoming respite after a busy day. It’s also the site for some of Leavenworth’s most exciting fall festivals and celebrations. Stick around through the weekend to enjoy the Autumn Leaf Festival, Leavenworth’s original festival dating back to 1964. There’s also live music in the Gazebo, Art in the Park, Fall Wine Walk and Oktoberfest. Visitors from all over the country flock to scenic Leavenworth in September and October to indulge in traditional festivities, fantastic food and of course beer! Take in a little sightseeing while immersing yourself in fabulous fall color. 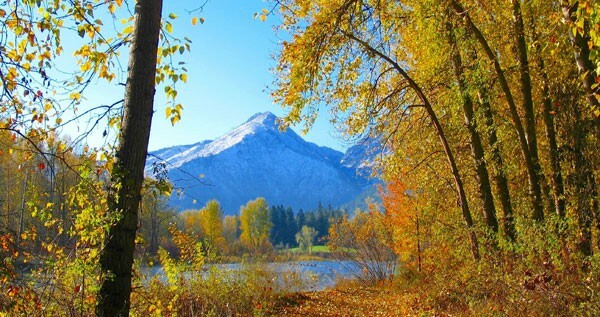 Head to Lake Wenatchee, located halfway between downtown Leavenworth and Stevens Pass. The 489-acre lake offers over 12,000 feet of waterfront with plenty of space to relax along the shore and take photos of the stunning fall scenery. The reflection of vibrant autumn colors on the lake is breathtaking. Tumwater Canyon, located along the Stevens Pass highway, is one of the top fall-foliage viewing spots in the region. Along the way are multiple pull-off areas for incredible viewing—and photo opportunities—of the towering cliffs standing above the roaring Wenatchee River. Don’t forget your camera! For information on places to stay and things to do in Leavenworth, visit leavenworth.org.